In 2002, a handsome 20-year-old young man (Li, Tao) madly fell in love with her. She ran a way from him for fear of being hurt again. After she disappeared in Beijing, Tao searched her up and down despite his parents' strong objection and ridicule. He finally found her dancing in a bar. They have never been separated since. They were very broke when SARS was spreading because all theaters were closed. In 2004, he got a license to be her legitimate agent and was trying to help her develop a unique performance. In a cold snowy night, when the two huddled in an underpass to wait for the sunrise in order to catch a bus after a long day at a movie shooting site working as extras, she suddenly had the urge to dance in the snow with him. She had used her dance to tell him her story so many times before and this time, after their "dance" ended, he suddenly realized that THIS should be her unique performance. In September 2005, she ran into a 21-year-old young man (Zhai, Xiaowei). He was being trained to be a cyclist for the national special olympics. He had never danced before. He climbed on a tractor when he was 4 years old and fell off it and lost his left leg. His dad asked him, "The doctor will have to amputate your leg. Are you afraid?" He couldn't comprehend what would be so different so he said no. His dad said, "You are going to face many challenges and difficulties in life, are you afraid?" He asked, "What are 'challenges and difficulties?' Do they taste good?" His dad laughed with tears, "Yes, they're like your favorite candies. You just need to eat them one piece at a time!" (Then his dad ran out of the room in tears.) So he's always very optimistic and athletic with a great sense of humor. He had tried high-jump, long-jump, diving, swimming, and just settled on cycling. His coach believed that he would be able to get 2-3 gold medals in the national special Olympics games. (In the video interview, you can see him doing a bridge with great ease!) He initially didn't understand how he could "dance," so Li invited him to see her performing "Hand in Hand" with another male actor. He felt that he saw a perfect soul dancing on the stage and agreed to give it a try. Li & Tao treated him like their younger brother and they stayed under the same roof during the more than 1 year of intensive training and practice. One would not be able to imagine the kind of challenges and difficulties they faced. He had NO dancing background and she is a perfectionist. There are so many touching stories. Much determination has gone into the making of this performance. Just for that one "drop" move at 3:41 of the clip, he landed her on the hard floor more than 1000 times!!! To get the move right, they started at 8 a.m. and got the first successful move shortly after 8 pm! All they did was to train and to practice from 8 a.m. to 11 p.m. day-in and day-out until the three of them ran out of money in early 2007 ... The rest is history. In April they were one of the finalists among 7000 competitors in the 4th CCTV national dance competition. It is the first time a handicapped couple ever entered the competition. They won the Silver medal with the 99.17 high score and not to mention the highest audience popular votes. They became an instant national hit. 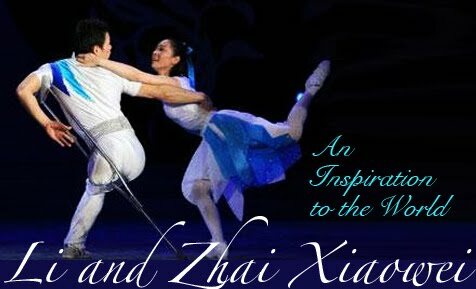 Incredible Ballet- Heart touching...Hitting my soul..NO Words!! Nothing is left to say about these wonderful couple which is a big inspiration to the world....At last i would like to tell everyone that "Strength doesn't come from physical capacity. It comes from indomitable will". Hat's off and salute to this incredible couple..The best example of this quote..." Great works are not performed by strength but by perseverance"....GOD BLESS THEM ALWAYS!!! Dis is ABILITY ! CAPABILITY , POSSIBILITY. Thanks adesh for posting and sharing such a wonder ful extra ordinary artistes and a perfect example for Ability.....THIS PROVES DIABILITY IS AN ART !